Long sitting idly in Tutubi's Blogger draft, herewith is information for people looking for nearer and cheaper alternative swimming pools around Metro Manila, including free entrance fees (list gathered from TV news reports), some from Tutubi's friends, official websites and others are just personal knowledge of Tutubi. If you happen to know other public swimming pools or know of any updated information, please hit the comments. This list is shall always be "unfinished"
As always, Tutubi is not affiliated with any of these resorts and public swimming pools. Please call published telephone numbers, email address or visit official websites for bookings, resort entrance fee/admission prices/room rates/swimming fee, inquiries, reservations, event venue, rules, proper swim attire, length/width/depth of pools, bringing in of food and drinks (including beer and alcoholic drinks) corkage fees and other stuff. 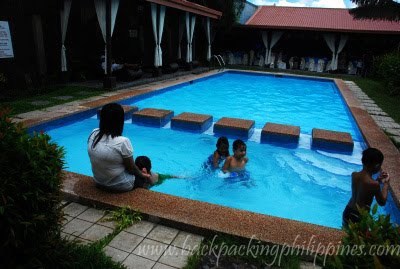 hi Tutubi, is the pool at Philam homes open to the public? when is the best time to visit and do laps? is the place crowded?thanks! Great post. Really informative about pools. Thanks for sharing this to us. Hi, is philam homes swimming pool available for night swimming? Philippine Army Gym, mon-sun 8am-6pm, except monday morning for pool cleaning. additional open time Tues & Thurs 6-10pm. Entrance=P100. olympic size.